Busy ol' week coming up as bands start to round off their 2008 in spectacular style. Feeder play Brixton Academy on Monday night with support from Fightstar, if paint by numbers pop-rock is you thing - tickets are £25 each. Meanwhile, The Wombats keep a generation of identi-kit "indie" teens amused for the evening at Shepherds Bush Empire - tickets are £18.50 each. If you want something a bit more "cultured" then Leonard Cohen plays the Royal Albert Hall for the first of two nights - tickets are between £75 and £100 and available from the box office. US indie rockers Death Cab For Cutie play Brixton Academy on Wednesday night and seem to be having some trouble shifting tickets - they're now halfprice (£10) from Gigantic, or full price from See Tickets. Alternatively, if you want something a bit heavier then classic Marillion play the Forum - tickets are £25 each from Ticketmaster. The Kills bring fashionista rock to the Astoria on Thursday night - tickets are a reasonable £12.50 each. Alternatively, Ryan Adams and the Cardinals play Brixton Academy - reportedly they're on fire and fresh from supporting Oasis, so should be a good night (if you like that sort of thing...). Tickets are £25 each. To round out the week, catch dark electro stars Ladytron at Shepherds Bush Empire on Friday night - tickets are £14.50 each. Alternatively, for some simple pop punk from Elliot Minor, pop on over to the Forum where they play - tickets are £13.50 each. 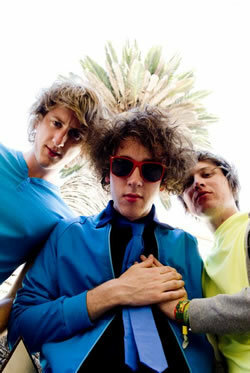 Photo of The Wombats comes from their Myspace profile.